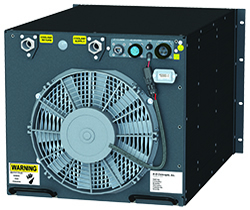 DMC-15/-20-DC Overview - K-O Concepts, Inc.
K-O Concepts, Inc catalog DMC-15/-20-DC rack-mount water chiller can cool heat loads from 1,500-2,000 watts. 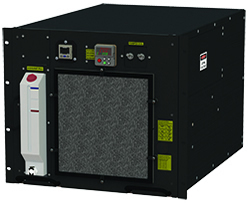 These industrial process water chillers have been designed for airborne military applications. The DMC-15/-20-DC has advanced temperature control that is able to maintain ±0.1°C of set point. The volume of a DMC-15/-20-DC is 58-66% less than competing models. 28 VDC Powered coolant chiller for airborne cooling applications. Standard 19 inch, rack mounted configuration allows the cooling module to be integrated with the equipment to be cooled. Fully enclosed cabinet is equipped with handles for ease of installation. Weights only 98 lbs. / 44.5kg. The chiller is air-cooled for portability. The “PID” multi-loop controller accurately maintains the desired process coolant temperature to within 0.1°C of set temperature. The dual digital readout on the User Interface module displays both set and actual process coolant temperatures. Waste heat is harvested from the system’s compressor to quickly raise the temperature of the process coolant. Approximately 40% of the BTU rating of the chiller unit is available for heating the process coolant up to 50°C without any external heat load. Standard RS-485 communications or optional RS-232, Modbus RTU or TCP, USB 2.0, DeviceNet or Profibus DP. Optional 6 Digital Input/Output alarm signals via communications. Both DMC models operate from 28 VDC. K-O DC chillers come standard with Teflon / Tefzel wire harnesses to meet flight qualification standards. All models use environmentally friendly R134a (HFC-134a) refrigerant for mobile applications. Standard centrifugal style process coolant pump provides 16 liters per minute @ 19psi available pressure. Optional positive displacement style process coolant pump provides flow from 3 - 10 liters per minute @ 70 psi available pressure. Includes nickel-brazed heat exchanger and upgraded 316 stainless steel fittings. Optional easy service DI cartridge is available. Chillers are designed for easy service and maintenance. Convenient process coolant fill & drain features on all models. Access panels for ease of electrical service. The EU-PCB monitors and reports interface signals via front panel LED’s, audible alarms and/or power down on any or all fault signals. The DPG is an upgrade to the mechanical pressure gauge. The transducer operates from 0-145psi and has a 0.25% BFSL accuracy rating. The transducer has all stainless steel parts with no o-rings. The controller displays “in-range” pressure values in green and “out-of-range” pressure values in red.